Going Commando | A SWTOR Fan Blog: Happy Third Birthday, SWTOR! It's that time of year again... to wish The Old Republic a happy birthday! It was three years ago today that the game officially launched, after having had an early access period of several days. As usual, I'd like to talk a bit about what's been going on in the game in the past year. 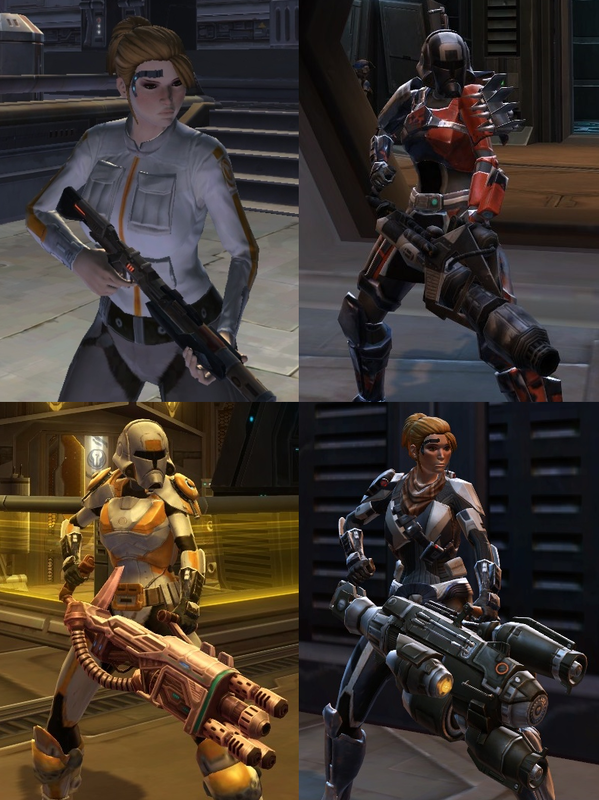 Shíntar the trooper over the course of three years - if there's a theme here, I'd say it's "bigger guns". If I had to sum it up in two words, I think the general attitude on display this year could be summed up as "cautiously optimistic". SWTOR's first year was full of hype but also suffered from a lot of negativity, and while the situation stabilised in 2013, the shadow of all that bad press still seemed to hang over the game to some extent. This year, year-on-year revenue was apparently down, but EA actually dared to talk about the game again and proudly announced that it has a million monthly players these days. We even got an infographic, which - while not necessarily containing all the information we would have liked - showed that the people at the top are at least confident enough about the game again to let us see some numbers. The community has been thriving as well. After the year started off on a bit of a sad note, with major fan sites Darth Hater and TORWars closing up shop, new contenders quickly sprang up like mushrooms after the rain, and I've had to expand my blog's section of SWTOR links multiple times this year. How has SWTOR been doing in terms of new content releases? We got both a story and a feature expansion, just like we did in 2013. Bioware nearly missed the boat with operations by letting us sit on Oricon for over a year, but since they managed to squeeze in two new ops before the end of the year with the release of Shadow of Revan, they still came out as being roughly on track. We also saw an unprecedented number of new flashpoints, with a total of six new releases in 2014. You could also say that we got two new world events this year, depending on your interpretation of what counts as such. The Rakghoul Resurgence was definitely an event, but was it truly new? Personally I thought that it was different enough from the original Rakghoul event to count as a genuinely new addition. The other new event was Soovada, which was definitely new - but not that much of an event in my opinion. PvPers were a bit neglected as we only saw a single new warzone this year, Quesh Huttball, which - while a fun and different way to play Huttball - didn't introduce a new type of gameplay. The ranked arena seasons kept chugging along steadily but didn't seem to attract a huge amount of interest. I suspect that the talk of endless queues and queue-syncing cheaters served as a deterrent to many. Overall I feel that it's been a year that's had the dev team very focused on certain key features - such as the introduction of housing and conquests, the revamp of the talent trees into the new discipline system, and telling the story leading up to Shadow of Revan - but that provided relatively little filler and quality of life changes in-between. For example we saw no new playable species or companion this year, nor did we get any new questing areas until the expansion (whereas 2013 saw CZ-198 and Oricon released as patches). It's no wonder that some of the periods between major releases felt a little bleak. However, I'm hopeful that with all these new systems firmly in place now, Bioware will be able to refine things in the upcoming year and put some work into adding to and improving areas of the game that have been a little neglected in 2014.